Promo is for Kids Only! Philippine Airlines Promo 2017: Enjoy a memorable family getaway with a FREE flight from Philippine Airlines. 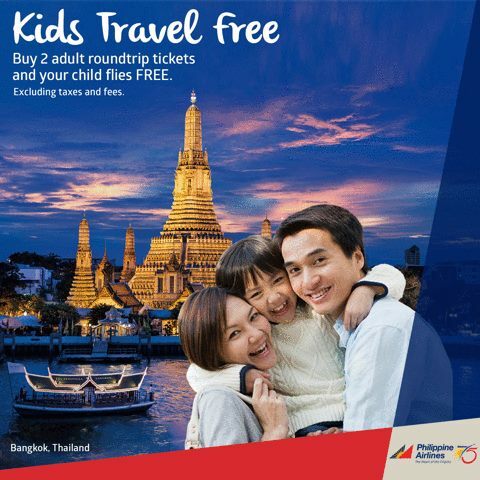 In celebration of National Children’s month, your child flies free when you buy 2 adult tickets. So if you have a kid (one) with age from 0 to 11 years old, you can have his or her fare for FREE provided all the requirements are met. How nice it is to be a kid once more? With these opportunities or perks that PAL is providing to their avid customers, I'm sure a lot will be happier these holidays. Take note, there is only a specific destination where this promo is good for. Your destination of travel should be anywhere in Bangkok (Thailand) or Port Moresby (Papua New Guinea). Of course to mind the travel dates. Pls. refer below. *Applicable only for children from 0 month to 11 years old.